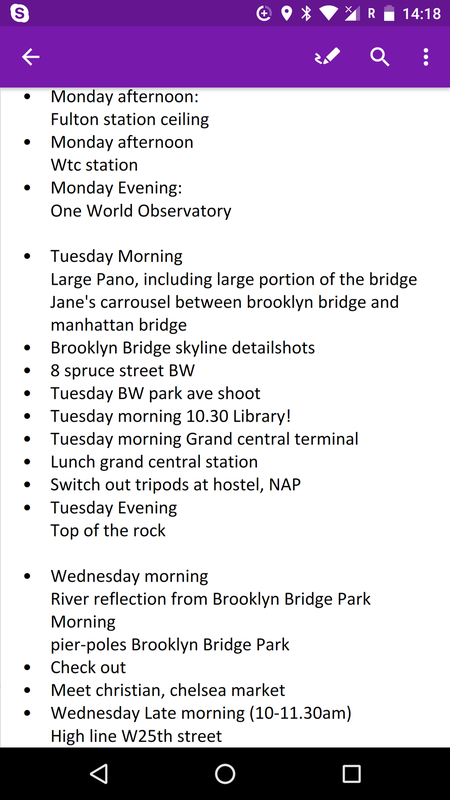 My shot-list for a total of 48 hours in New York. One focus I had was getting the images I wanted to get last time, but couldn't, due to circumstancial reasons, such as the World Trade Center station not being completed or the One World Observatory not yet being open to the public. Logically those went to the top of the list. Shooting them was a blast - the architecture of the WTC station is simply stunning - and resulted in quite a few nice images. The WTC station ones are even going into their separate series at some point. East River with Brooklyn and Manhattan Bridge during the blue hour of dusk, as seen from One World Observatory. How to shoot through glass without reflections. Also, how to stabilise your camera when security confiscates your tripod. After only 3 hours of sleep I was up again at 3.30 am to catch the A Train to Brooklyn Bridge Park to shoot the sunrise behind Manhattan Bridge. The nice thing about sunrises is that you are all by yourself. You can soak in the whole atmosphere, enjoy the scene and really live the moment. Sunrises over sunsets anytime! The rest of the 2nd day was spent chasing other shots I had planned: Details of the building facades (below), Grand Central Station (finally!! ), New York Public Library (what a bust, there is a witch cursing everybody with a DSLR upon sight, smartphones are fine obviously), 8 Spruce Street (my favourite building in the whole of NY, by far) and skyscrapers on Park Avenue / Madison Avenue / Lexington Avenue for a project I am working on. Detail shots of building exteriors - such as this image - were one focus of my time in New York. In the afternoon I rewarded myself with a little naptime (after backing up my images of course) at the hostel, until it was time to start camping on the Top of the Rock on Rockefeller Center. 2-3 hours I stood in place to reserve my spot for a shot of the Empire State Building at dusk. Sadly the weather did not cooperate at all and all the action and colours were happening in the opposite direction, uptown. Still, got a decent image, but I will need to go back there at some point. Highlight of the evening was definitely meeting a friend of mine from Switzerland and hanging out with him. Next day, same procedure: up at 3.30, ride to Brooklyn Bridge Park for sunrise. Just as light starts getting interesting, BOOM, out of nowhere a flash thunderstom hits me. I just managed to throw the camera and electronics into my bag and flat-out sprint to the closest shelter I could find. Completely soaked, freezing and shocked I managed to get me an Uber back to the hostel, where I would get a few more zzz's, still freezing from being wet. The rest of the day I dedicated to checking out and wandering the High Line and Chelsea Market with my friend from Switzerland I met the previous evening, what a great coincidence! Now it's time to move on to Jersey to meet up with Derek, so we can get the road trip started tomorrow. I'd be lying if I said I was done with New York photographically speaking. I'm a long ways from it. Already making plans on what to shoot next time around. First, some National Parks though! I'll be back with an update after the first stop - Badlands National Park.